December 25, 2012 – the Holy Synod met at the Patriarchal and Synodal Residence in the St. Daniel Monastery in Moscow. The sessions were chaired by His Holiness Patriarch Kirill of Moscow and All Russia. The Synod summed up the work carried out by the Pre-Council Presence and the Supreme Church Council in 2012 and approved its decisions. 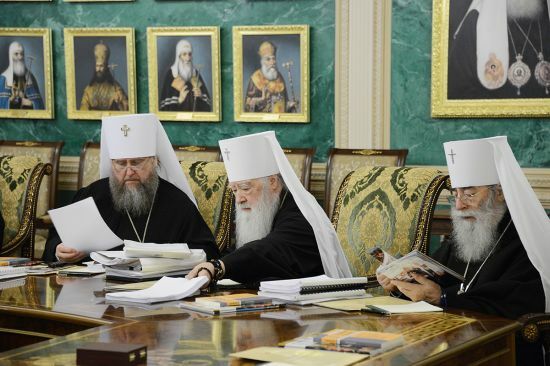 It was resolved to submit the following documents to the Bishops’ Council to be held from February 2-5, 2012: ‘A Provision for the Election of the Patriarch of Moscow and All Russia’ (in four versions); ‘On the Church’s Stand Concerning the Development of a Technology for Recording and Processing Personal Information’; ‘The Russian Orthodox Church’s Position on the Reform of Family Law and Problems of Juvenile Justice’; and ‘The Russian Orthodox Church’s Attitude to Urgent Ecological Problems’. Having heard His Holiness’s report on the commemorative celebrations held in 2012, the Synod expressed satisfaction with ‘the broad participation of the Russian Orthodox Church in the celebrations marking the 1150th anniversary of the Russian State, the 400th anniversary of the Overcoming of the Russian Time of Trouble’ and the 200th anniversary of the victory in the 1812 Patriotic War. It was important, the Synod noted, ‘to attract people’s attention to these historic events as the memory of them not only cultivates respect for the past but also helps to find the right way to the future in faithfulness to the Orthodox Church and the Motherland and in commitment to the ideals and principles of the Orthodox faith which have formed the people of historical Russia’. The Chairman of the Department for External Church Relations, Metropolitan Hilarion of Volokolamsk, made a report on the participation of a ROC delegation in the funeral services for His Holiness Patriarch Maxim of Bulgaria and His Beatitude Patriarch Ignatius IV of the Great Antioch of All the East. In a break between the sessions, the Holy Synod members lifted up prayers for the repose of the late Primates of the sister Local Churches in the dwellings of the righteous. The Holy Synod considered the results of the Patriarchal visits to the Patriarchate of Jerusalem, Belarus and various dioceses in Russia. Metropolitan Hilarion made a report on missions to other countries made in the period between the October and December sessions. The Holy Synod also considered the minutes of the 16th World Russian People’s Council, the Interreligious Council in Russia, the 2nd Forum of Orthodox Women, the Conference on Theology in Universities: Cooperation Between Church, State and Society, and the reports about the participation of the Moscow Patriarchate representatives in the 6th Assembly of the Russian World and the 12th Forum ‘St. Petersburg Dialogue’. The Synod examined the results of conferences and meetings held since its previous session, including the conference of bishops in the far-abroad countries devoted to the 5th anniversary of the signing of the Act of Communion, the meeting of the joint working group of the Russian Orthodox Church and Turkey’s Office for Religion, the meeting of the coordinating committee of the Joint Orthodox-Catholic Theological Commission and the theological talks between the Russian Orthodox Church and the Evangelical Church in Germany. The Synod adopted ‘The Provision for the Work of the Russian Orthodox Church’s Sunday Schools in the Russian Federation’, “The Model Statute of a Private Educational Institution for Children’s Additional Education ‘The Religious and Moral Education Center of a Local Religious Organization of the ROC (Moscow Patriarchate) Orthodox Parish’”, and ‘The Educational Standard for the ROC Sunday Schools (for children) in the Russian Federation’. These documents were developed in 2011 and 2012 by the Synodal Department for Religious Education and Catechism and discussed in the Internet and by the 2012 International Christmas Educational Reading. The Synod underlined the framework character of these documents which should be adjusted to local conditions. Taking into account local by-laws, these documents should also be used by self-governed Churches and other dioceses located outside Russia. The documents will be published within the next few days by the official website of the Synodal Department for Religious Education and Catechism. To implement the Decision of the Bishops’ Council (February 2-4, 2011) on ‘Measures for Preserving the Memory of New Martyrs, Confessors and All the Innocent Victims of Persecution in the Theomachist Years’, the Synod has established a Church-Public Council for Perpetrating the Memory of Russia’s New Martyrs and Confessors to be chaired by the Patriarch of Moscow and All Russia, and approved the membership of the Council.